IP Lasso » A $6 Trillion App Marketplace? A $6 Trillion App Marketplace? 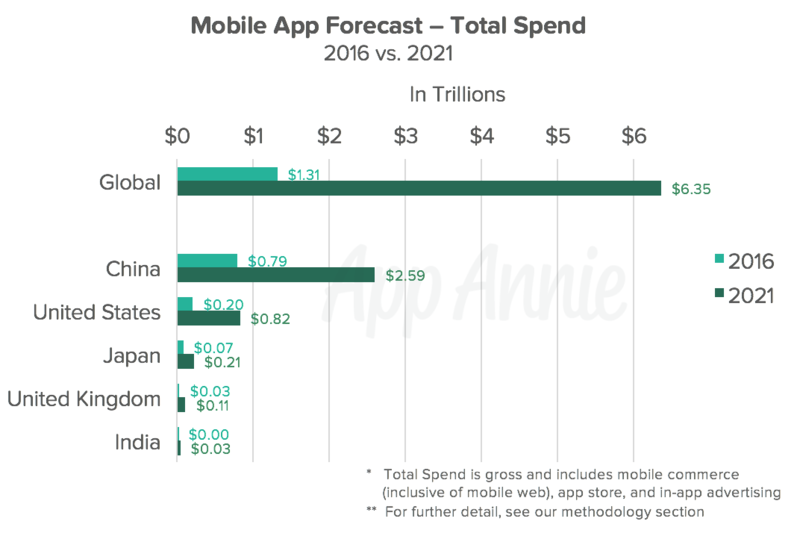 App Annie’s latest market forecast projects an astounding $6.35 trillion app economy by 2021. The company’s data shows that in 2016, the total app spend was $1.31T across the three major types of monetization: all mobile app stores, in-app advertising and mobile commerce. The app user base is also expected to see a significant rise. App Annie says the global app user base was 3.4 billion in 2016, but will come close to doubling by 2021, when it predicts 6.3 billion users. Average spending across the app industry will also increase. According to App Annie, the average in 2016 was $379 per person, but by 2021, the prediction is for the average to reach $1,008 per person. This includes app stores, ads, and mobile commerce combined. This rapid growth is certain to attract fraudsters in greater numbers. Be sure you know how your IP is being represented in the app stores. We would be happy to provide a free Brand Report for you- just drop us a note here.